You haven't sent me a picture so ive added my own, hope it would help. 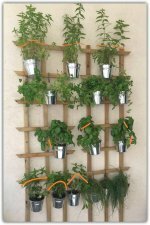 You haven't sent me a picture of you plant so ill try to explain. Start by pruning and remove the Gray (dead) ones. After that you'll get a clear view of the grapevine skeleton, and it will be easier for you to move on! prune the dead branches : follow the dead branches until you'll reach the point where they connected to the main stem and prune them half inch away from the connecting point. 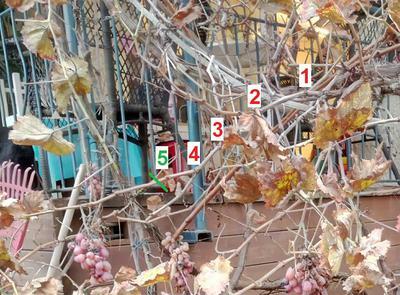 After pruning, What you should be looking for ? before you move on the the next cut, make sure to look at the inner part of the branch you just pruned. Take a look at the picture where I'm holding a piece of pruned stem. See the green spot in the middle? that's how you'll know that the branch is a live and healthy. O.k but what about the fruits? the grape clusters? like with roses there is and old discussion, where to prune exactly to get the best results? so in order to get better fruits, during the last few years the new recommendations is to prune above the Fifth "Eye" or "Bud". 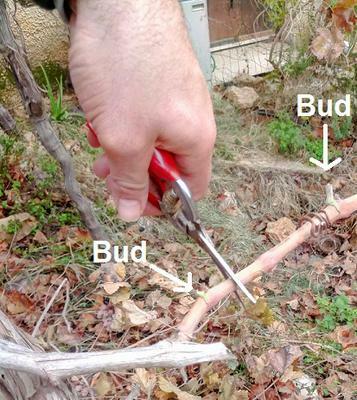 as shown in the picture, count 5 "buds" from the main trunk and prune just above it! don't worry, you'll get fruits even if you'll prune above the first bud, but the latest news regard better fruits tells that the fifth bud is the best. Comments for How sould i prune my grape vine?